Although Göbeklitepe has firmly established its position in the world agenda in recent years, what we hear or what we read about Göbekli on the internet may not always be true. There are many speculations about this monumental structure. 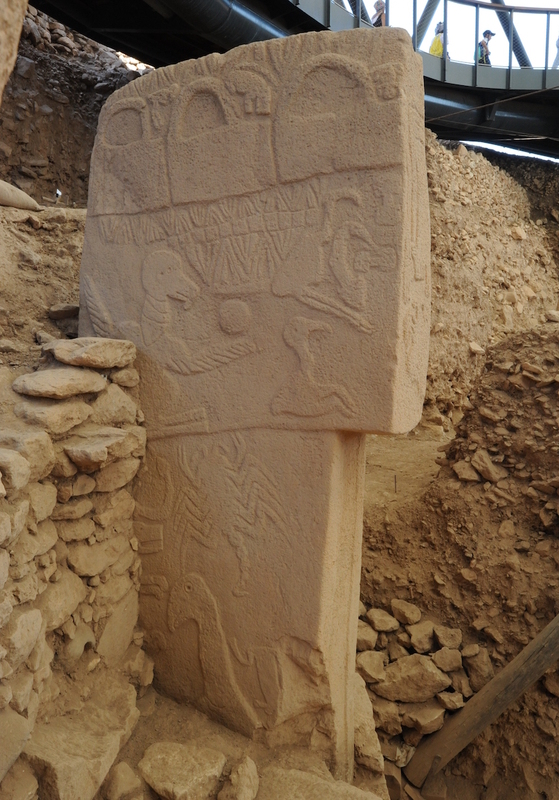 Under these circumstances, the best option to learn about Göbeklitepe is to contact the experts. 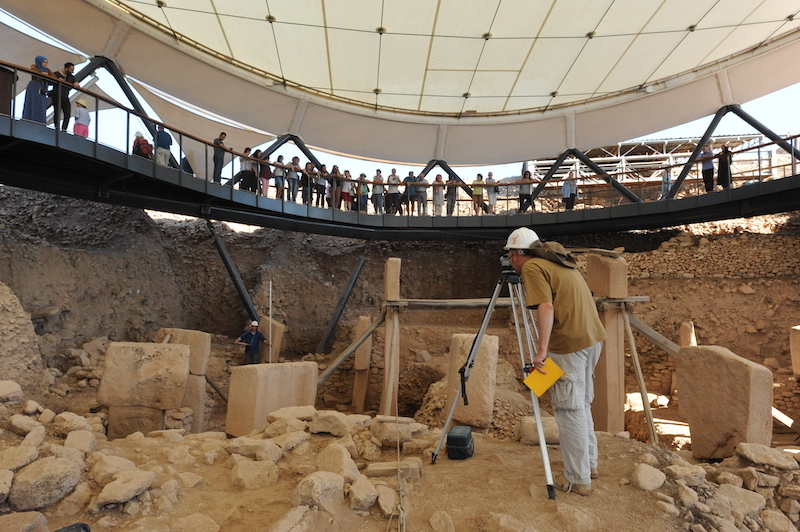 Coordinator of research and fieldwork at Göbeklitepe from the German Archaeological Institute, Dr. Lee Clare answered Arkeofili’s questions. 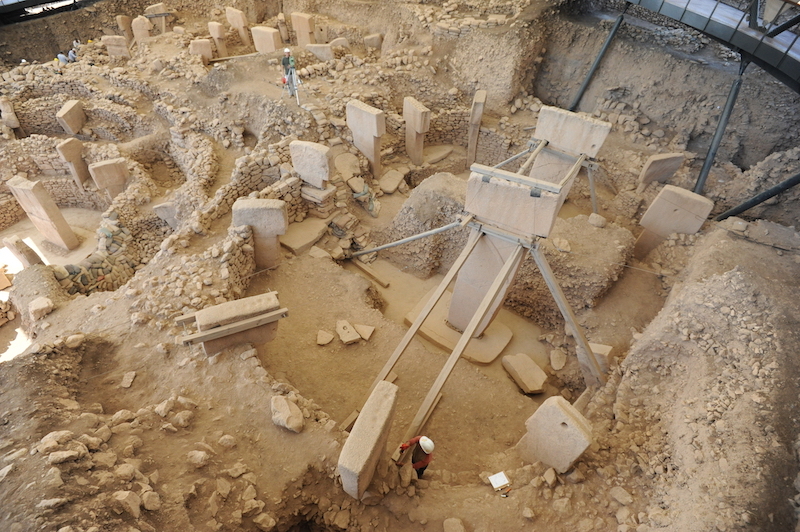 Building archaeological recording underway in the southeast hollow (main excavation area) at Göbeklitepe (September 2018). The new permanent shelter provides visitors not only with unprecedented views of the excavated monumental buildings but also allows them to get close to the archaeologists working at the site. German Archaeological Institute (DAI), Göbekli Tepe Archive. 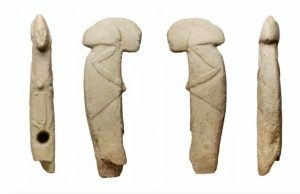 1-What is Göbeklitepe? Is it a temple? 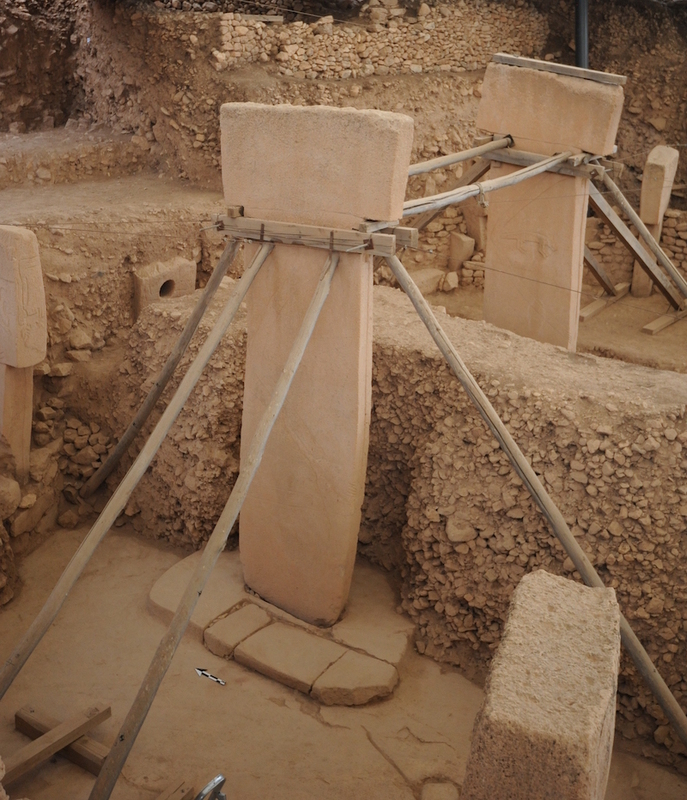 Building D at Göbeklitepe is the best preserved of the monumental buildings so far excavated. The T-shaped pillars reach a height of approx. 5,5 metres and are carved from one piece of limestone. Interpreted as stylised representations of human-beings, the T-pillars appear to congregate (as if participating at a meeting) around the two taller central pillars. German Archaeological Institute (DAI), Göbekli Tepe Archive. 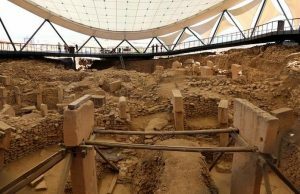 2- Is Göbeklitepe a meeting point? The two central T-pillars of Building D were inserted into carved pedestals. The building itself was constructed upon the natural limestone bedrock which had been carefully smoothed. The area between the two pillars has not yet been excavated. 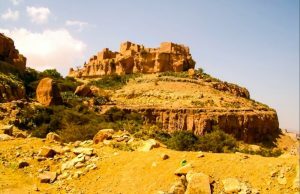 The fill of the monumental buildings typically comprises fist-sized limestone rubble, stone artefacts, and large amounts of animal (and occasional human) bones. German Archaeological Institute (DAI), Göbekli Tepe Archive. 3- What time of the year hunter gatherers were came together in Göbekli? Is there any information about that? Pillar 18 (P18) is the eastern of the two central pillars in Building D. The carved human attributes are clearly visible, including the arm (bent at the elbow) and the two hands resting on its stomach. On the narrow (front) side of the pillar a belt and loincloth can be made out. Under its arm P18 appears to be carrying a fox. German Archaeological Institute (DAI), Göbekli Tepe Archive. 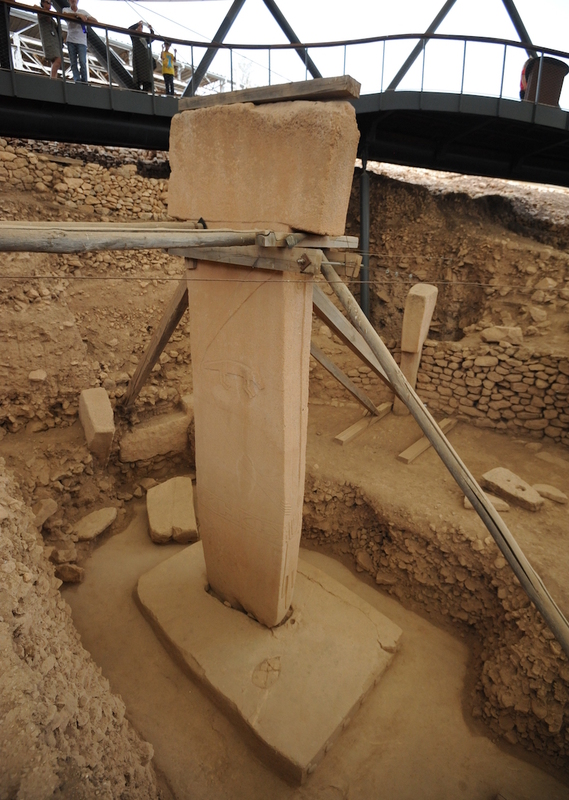 4- What has Göbeklitepe changed about what we know about history? Pillar 43 (P43) Building D features a vast array of different images, including animals, geometric patterns, and perhaps even depictions of the monumental buildings themselves. P43 also features one of the very few images of a human-being found carved onto a pillar (bottom right). The individual is male (phallus) and decaptitated. German Archaeological Institute (DAI), Göbekli Tepe Archive. 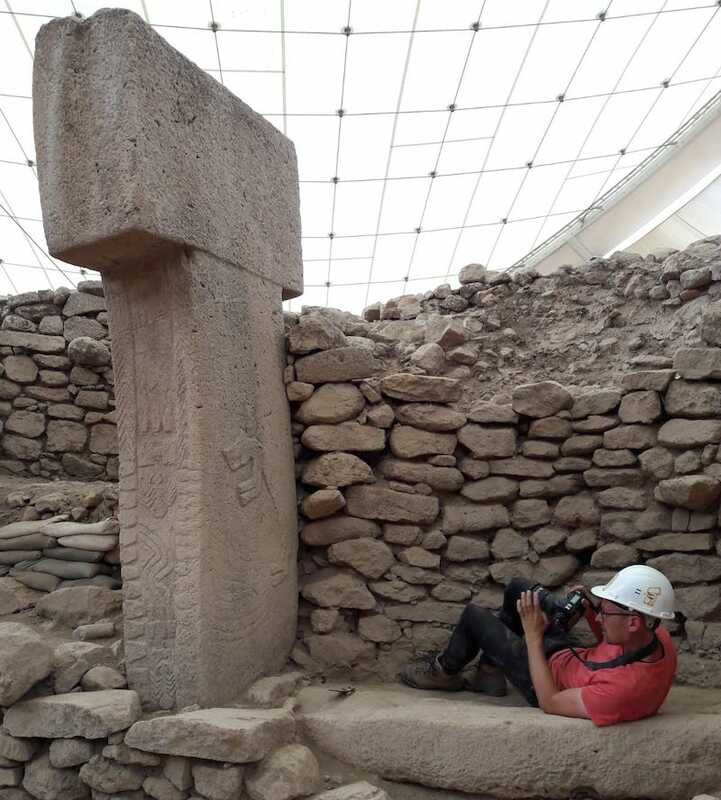 5- Last year, fragments of three carved human skulls have been uncovered in Göbeklitepe and researchers said that it could be a part of skull cult. Is there any other evidence about the skull cults in Göbekli? Yes, these skull fragments featured deep incisions which suggest that they were decorated and perhaps even (publically?) displayed. As far as we know, skulls with such deep incisions (carvings) are unknown at other sites in Anatolia/Near East. Nevertheless, the obsession of 9th and 8th millennium BC communities with the human head is nothing new. The removal of the skull from the dead and the their subsequent manipulation, including the recreation of facial features using plaster and other forms of decoration, as well as their deposition, also as skull caches, have been documented at numerous sites. In fact, I would have been surprised had Göbeklitepe not produced evidence for “skull cult”. Its existence was previously suggested, for example, by the depiction of a headless man on Pillar 43 (P43) in Building D, and numerous “decapitated” human sculptures found at the site. 6- What could depictions on the steles telling us? Is there any human depiction? 7- Currently, what are the primary research questions you’re seeking answers to?